What are causes and risk factors for dandruff? What tests do health care professionals use to diagnose dandruff? What are treatments and medications for dandruff? What is the prognosis for dandruff? The exact origin of the term is rather obscure. Dander consists of white to tan flakes found on fur or feathers. Ruff, the second syllable, probably originates from the word scurfy, which means scale arising from the most superficial layer of the skin. In any case, dandruff is the popular term for the small white flakes that conspicuously appear on the shoulders of your black sweater or blouse after your scratch your flaky scalp. This is distinctly different from the much larger white flakes and dead skin cells that can result from psoriasis, a skin disease that can respond to coal tar treatments. Dandruff is also not from a fungal infection that could respond to ketoconazole. 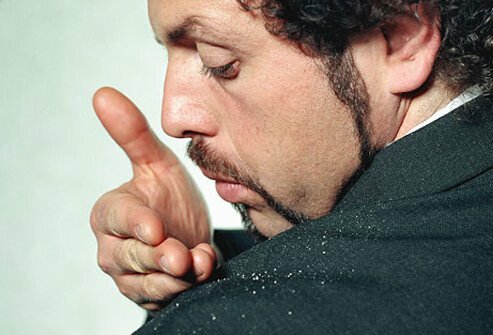 Dandruff is also distinctly different from eczema that responds to cortisone creams and contact dermatitis, which is an immune reaction to a chemical or metal. The skin in the scalp area produces more skin grease (sebum) that originates from hair follicles and the skin than any other anatomical region. Realistically, the most anyone washes their hair is once a day, and frequently much less often than that. Shampooing with soap is responsible for removing moisturizing fats (lipids) that naturally accumulate on the scalp and hair to prevent dryness and flaking. It would require multiple washes per day of a hairless scalp to achieve significant drying (xerosis). Dry skin (xerodermatitis) does not just happen because of dry air, but it can occur because of hormones out of balance (such as hypothyroidism) and with increasing age. I do not believe that dry scalp is a common problem. The belief that excess scale in the scalp is ever due to dryness is almost always incorrect and can lead to mistreatment of the real cause. So for the remainder of the article, I will refrain from using the term dry scalp. Moisturizing: Moisturizing lotions don't do much more than smooth out scales and make plaques look redder. Switching brands of shampoo: Shampoo doesn't cause dandruff. However, medicated shampoos (see below) can help. Changing hair-care routines: There is no "right" shampoo or conditioner. What is more important is the frequency with which these agents are used. As a rule, the more frequently one shampoos, the better the result. Seborrhea and dandruff are not caused by excessive shampooing "drying out the scalp." Hair dyes and conditioners do not cause or aggravate dandruff. The presence of dandruff in abundance is a clue to either the presence of an inflammatory skin disease affecting the scalp or a relative lack of shampooing. All skin constantly sheds dead skin cells, if one does not remove them, they will accumulate, appearing as white to yellow flakes on one's clothing. Alternatively, an inflammatory skin disease affecting the scalp, such as seborrhea dermatitis (eczema), psoriasis, or a fungal infection, can cause rapid growth of skin cells, producing excess scaling so abundant that it is often impossible to remove it even by shampooing frequently. Dandruff is a sign of a potential scalp problem if it is present in excess. If one neglects washing one's hair, it is perfectly reasonable to expect to see dandruff. Simple regular shampooing will resolve the problem. On the other hand, if there is an inflammatory disease that is responsible for the production of excessive scaling, then treatment of this underlying problem can control the production of those unsightly flakes of skin. If a disease is present, dandruff is frequently accompanied by itching. A physical examination of the scalp skin is necessary to determine if a disease is present. Occasionally, a doctor may remove a portion of the scalp skin surgically so a pathologist can examine it to aid the physician in arriving at the correct diagnosis. Dermatologists have the most expertise in correctly diagnosing and treating scalp diseases. The most common scalp disease producing excessive dandruff is seborrheic dermatitis. The cause is unclear (it is believed by some to be due to excess growth of the skin yeasts Pityrosporum or Malassezia), but a disturbance in the balance between normal scalp microbes has been postulated. It is easily controlled with safe, effective topical medications. Seborrheic dermatitis is characterized by exacerbations and remissions and recurs if treatment is stopped. There is no known cure. Medicated, anti-dandruff shampoos containing zinc pyrithione, coal tar, salicylic acid, selenium sulfide, or ketoconazole are effective at controlling seborrheic dermatitis. It is not unusual to supplement these shampoos with a medium potency topical steroid lotion, solution, or foam applied to the scalp once or twice a day. There is little compelling evidence to suggest that either tea tree oil products (a single Australian study funded by the Tea Tree Oil Institute in 2002 using a 5% tea tree oil shampoo reduced dandruff in healthy individuals) or apple cider vinegar is of any benefit in controlling dandruff. Since a variety of other skin diseases can affect the scalp, an examination by a physician with special expertise in treating and diagnosing skin diseases is recommended if nonprescription shampoos are ineffective. If the dandruff is related to the infrequent use of shampoo, it often can be controlled entirely by more frequent washing. If it is due to seborrheic dermatitis, it is easily controlled with a variety of shampoos and the use of topical steroids products. These products do not cure the problem. If treatment is discontinued, the disease will eventually return. They should use effective treatment just frequently enough to control the problem. Excessive use is just a waste of money and will not improve the long-term outlook. Other scalp diseases causing dandruff require more specific treatments. The best prevention is probably to use an anti-dandruff shampoo (medicated shampoo, such as selenium sulfide shampoo) as your regular shampoo frequently and regularly. Deeksha, Rishabha Malviya, and Pramod K. Sharma. "Advancement in Shampoo (A Dermal Care Product): Preparation Methods, Patents and Commercial Utility." Recent Patents on Inflammation & Allergy Drug Discovery 8 (2014): 48-58. Schwartz, James R., et al. "A Comprehensive Pathophysiology of Dandruff and Seborrheic Dermatitis – Towards a More Precise Definition of Scalp Health." Acta Derm Venereol 93 (2013): 131-137. Turner, G.A., M. Hoptroff, and C.R. Harding. "Stratum corneum dysfunction in dandruff." International Journal of Cosmetic Science 34 (2012): 298-306. Please share your experience with dandruff and/or dry scalp. What dandruff treatments have you found to be effective? Diflucan (fluconazole) and ketoconazole are anti-fungal medications used to treat different types of fungal infections. Diflucan is used to treat vaginal, oral, and esophageal fungal infections caused by Candida; urinary tract infections, peritonitis, pneumonia and disseminated infections caused by Candida; cryptococcal meningitis; and to prevent Candida infections in patients treated with chemotherapy or radiation after bone marrow transplantation. Ketoconazole is used to treat thrush, ringworm, jock itch, athlete's foot, dandruff, tinea versicolor, blastomycosis, histoplasmosis, and coccidiomycosis. Is your hair or scalp trying to tell you something about your health? Some medications and conditions affect your hair as well as your body. Learn more about hair and scalp treatments. Ketoconazole (Nizoral, Extina, Xolegel, Kuric) is an anti-fungal medication prescribed to treat fungal infections such as thrush, ringworm, jock itch, athlete's foot, dandruff, tinea versicolor, blastomycosis, histoplasmosis, and coccidiomycosis. Side effects and drug interactions should be reviewed prior to taking this medication. Scalp psoriasis causes red, raised, scaly patches that may extend from the scalp to the forehead and the back of the neck and ears. Symptoms and signs include itching, hair loss, flaking, silvery scales, and red plaques. Treatment includes topical medicated shampoos, creams, gels, oils, ointments, and soaps, medications, and light therapy. A benign skin disorder due to excessive growth of the top layer of skin cells, usually found in persons over 30 years old. See a picture of Seborrheic Keratosis and learn more about the health topic. Topical selenium sulfide (Head & Shoulders, Selsun Blue, SelRx, Selsun Rx) is included in shampoos and lotions that treat seborrhea, dandruff, and tinea versicolor.